After a sugary cereal breakfast, we took a trip to Reno, which seems to be the farthest this family will ever let me go. We wandered through the streets and casinos a bit, then stopped for lunch at Planet Hollywood. 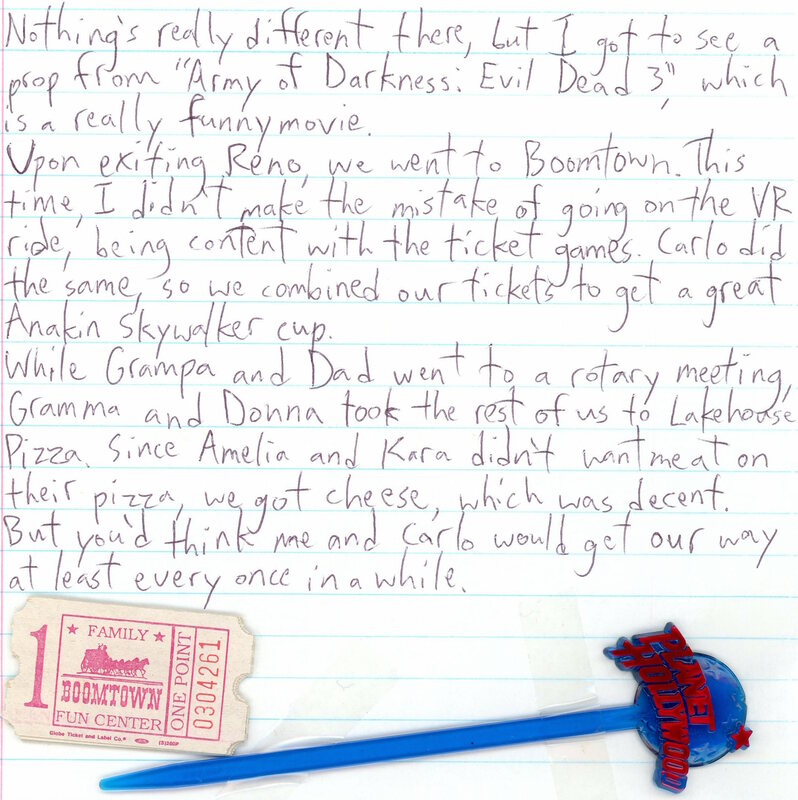 Nothing’s really different there, but I got to see a prop from “Army of Darkness: Evil Dead 3”, which is a really funny movie. Upon exiting Reno, we went to Boomtown. This time, I didn’t make the mistake of going on the VR ride, being content with the ticket games. Carlo did the same, so we combined our tickets to get a great Anakin Skywalker cup. While Grampa and Dad went to a rotary meeting, Gramma and Donna took the rest of us to Lakehouse Pizza. Since Amelia and Kara didn’t want meat on their pizza, we got cheese, which was decent. But you’d think me and Carlo would get our way at least every once in awhile.